Estimates of longevity, in this particular case, should be viewed with caution. The mortality impact isn’t easy to calculate, Ruhm and Preston said, because many conflicting things are going on at the same time. For example, although obesity is rising, cholesterol-lowering statins and blood pressure medications are reducing the risk that any individual will die from obesity. 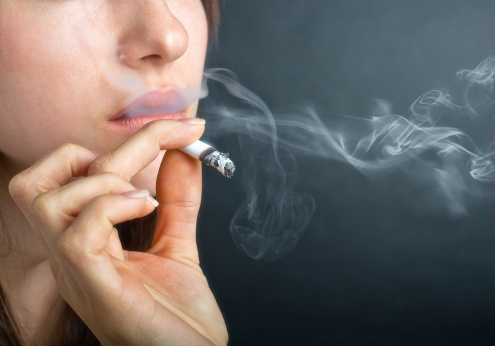 Also, the effects of cigarette smoking are extremely difficult to measure, because mortality depends on so many factors, including the length of time someone smokes and how many cigarettes they smoke per day – or whether they smoke filter cigarettes or not. The positive impact on men of these combined effects is greater than for women. For 40-year-old men living today, their U.S. life expectancy is about 78. 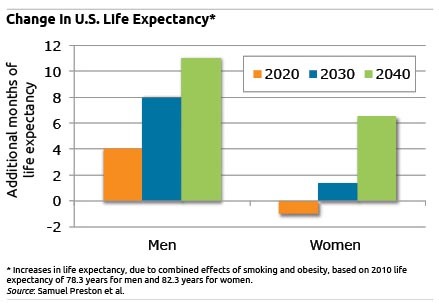 By 2030, due to the combined impact on men of changes in smoking and obesity patterns, they will live eight months longer; by 2040, that will increase from eight to 11 months. These estimates do not account for the impact of factors other than smoking and obesity that also affect how long people live. Women, who were slower to cut back on smoking and have done so to a lesser degree than men, will experience those health benefits later. Women who are now 40 have a longer life expectancy than men – age 82 – but obesity patterns will actually decrease that life expectancy slightly through 2020. By 2030, however, the beneficial effects of smoking reductions will begin to dominate and will cause women’s longevity to rise slowly, by more than one month. By 2040, their longevity gains will be more pronounced – more than six months– as smoking’s decline continues to improve women’s health. To receive email alerts about weekly blog posts, click here. There’s also Twitter @SquaredAwayBC, or “Like” us on Facebook. I don’t know if we can really compare smoking reduction and the rise in obesity. While I understand that you are looking at the population as a whole, they are separate issues that need to be addressed as such. Yes, its great that less people are smoking, but now we need to focus on getting more people at a healthy weight and diet. I really do think that obesity is more dangerous than smoking for your health. Yes smoking is a bad habit and you should quit, but obesity is a scary disease that a lot of people just deny. Living a healthy life means no smoking but also watch out with what you eat.